Take the first step in protecting your employees from eye injury with Our 32 oz Sterile Isotonic Buffered Eye Wash Station. 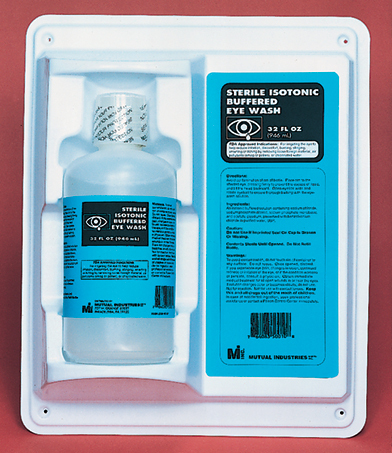 This convenient station can be mounted on a wall and contains a large (32oz) bottle of eye solution that will work to neutralize the effects of acids & alkalis, while flushing away other chemicals, foreign particles, or irritants from the eye. Refills are also available.